Amelia Earhart was born 116 years ago today on July 24, 1897 while the anniversary of her July 2, 1937 disappearance was just a few weeks ago. To this day, we still don’t know for certain what happened to her, but you might not know that from a lawsuit that’s been filed against the group searching for her lost aircraft. According to a local Wyoming paper (Side note: The construction of a cabin intended to be Earhart’s summer home in the state was never completed due to her disappearance), local Timothy Mellon (the son of Paul Mellon, as in the Mellon banking fortune and Carnegie Mellon University) is suing The International Group for Historic Aircraft Recovery (TIGHAR) for withholding the news of the discovery of Earhart’s aircraft in order to squeeze $1 million from him to pay for a later, superfluous search. Earhart’s aircraft being found may come as news to history buffs, but the lawsuit asserts that video footage from a 2010 expedition near Nikumaroro, an island in the South Pacific, shows wreckage of her Lockheed Electra (and speculation that she died as a castaway on the island is a very plausible scenario). TIGHAR’s attorneys have filed a motion to dismiss the lawsuit. Earlier this month, aviation enthusiasts and military veterans alike gathered outside Sheffield to mark the 70th anniversary of one of World War II’s most memorable air assaults: Operation Chastise, otherwise known as the "dambusters" mission. The gathering was extra special because vintage aircraft, including a Lancaster bomber, recreated a dambuster mission by performing three runs over the Derwent Dam in Derbyshire which, coincidentally, was used back in 1943 by the 617 Squadron pilots to train in preparation of the daring night missions using “bouncing bombs” against dams in Nazi Germany’s industrial heartland in the Ruhr Valley. Wales Online has profiled retired engineer Thomas Merlin Maddock who lives in the same Valleys house on Meadow Street, in Pontycymmer as pit carpenter and would-be aviator pioneer Christopher Carlyon did in 1904. Carlyon is not going to be a familiar name to aviation history buffs, but just months after the Wright brothers took to the air, the 17-year old started building his own flying machine in a shed he built 400 feet up a mountain near Bridgend called Coedcae. His plan was to build a flying machine to glide across the Garw Valley at its narrowest point of about half a mile. However and after several tests on the slopes below his shed, it and the shed were destroyed by a violent storm in 1910. Demoralised that his flying machine was destroyed before he could do a full fledged flight, Carlyon never returned to the project. Maddock only learned about the would-be aviator pioneer after his father attended the 59 year old Carlyon’s funeral in 1947. However, Maddock has no intention of taking the final craft for a test flight over the Garw Valley as he says that Carylon picked the most exposed part of south Wales and could have been killed trying to fly it there. Instead, he has found two pilots willing to fly the aircraft once its built, but it will be towed along on the ground to see if it lifts eight or 10 feet to prove this unsung local aviator pioneer right. 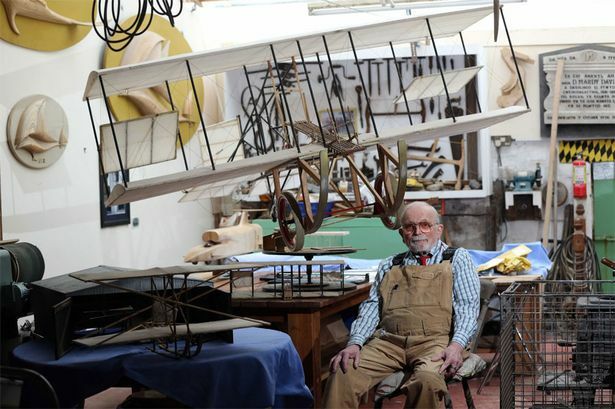 Merlin Maddock in his Pontycymer workshop with the 1/3-size replica of a glider first built by Christopher Carlyon, WalesOnline . In case you don’t know the story of Douglas “Wrongway” Corrigan, he learned to fly in the mid-1920s and later worked in an aircraft factory where he was actually responsible for the wing assembly and the installation of the gas tanks and instrument panel on Charles Lindbergh’s Spirit of St Louis. In fact, he and a colleague increased the lift of the Spirit of St Louis by extending the wing 10 feet (3.0 meters) longer and he pulled the chocks from the aircraft when Lindbergh took off from San Diego to New York to prepare for his historic flight. Corrigan also wanted to fly across the Atlantic and in 1935, he sought permission from the Bureau of Air Commerce for a non-stop flight from New York and Ireland. His application was rejected and over the next two years, he made repeated modifications to his aircraft and reapplications which were all rejected. Increasingly exasperated by government red tape and increasing aircraft regulations, its believed Corrigan decided to make an unofficial crossing. In 1938, he filed a flight plan to fly from New York to Long Beach, but instead ended up in Ireland. Corrigan claimed his unauthorized transatlantic flight was due to a navigational error caused by heavy cloud cover which obscured landmarks along with low-light conditions that caused him to misread his compass. It took a 600 word telegram by aviation officials to list all of the regulations broken, but he received only a 14-day suspension of his pilot certificate along with a couple of ticker tape parades when he returned to the States. He later bought an orange grove in Southern California where he quietly passed away in 1995 – never admitting whether his flight to Ireland was deliberate or not. We are hoping to perform the song in the very spot Douglas landed on July 18, 2013, provided we have clearance from air traffic control. We will log our song plan and will not deviate from its course, unlike good old Douglas. The Corrigan Brothers are also recording their second album (“Our Favourite Irish Songs”), will begin a world tour in October and are researching their family tree in the hopes of finding a link to “Wrongway” Corrigan.